Whether you’re looking for exotic marine life, colourful coral or decaying shipwreck treasure, these five best dive spots in the Western Caribbean won’t disappoint. 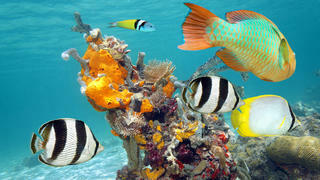 The Western Caribbean region has a considerable wealth of world-class dive sites. Mexico, Belize and Honduras are some of the best places to dive, and provide experienced and beginner divers alike with a countless wonders to explore. *1. The Great Blue Hole * The Great Blue Hole is one of the best dive sites in the world, not only the Western Caribbean. Located just 70km from Belize City, near a small atoll called Lighthouse Reef, this vast sinkhole measures 300 metres across and descends into a blue abyss nearly 125 metres deep. This dive is not for the faint-hearted as it is one of the best places to swim with sharks. Diver’s regularly record hammerheads, blacktips, Caribbean reef and nurse sharks around the waters of the Great Blue Hole. Thankfully these species are not renowned for aggression and ignore divers, although experience and caution cannot be overstated. Huge groupers are a typical, and slightly unnerving, fish species to find, as well as the prettier likes of parrotfish, butterfly fish and angelfish. This is one for any serious diver’s bucket list. Don’t just take our word for it… the legendary Jacques Cousteau also considered it one of the best scuba diving sites on the planet. Whether you’re looking for exotic marine life, colourful coral or decaying shipwreck treasure, these five best dive spots in the Western Caribbean won’t disappoint. 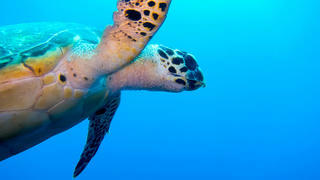 The Western Caribbean region has a considerable wealth of world-class dive sites. Mexico, Belize and Honduras are some of the best places to dive, and provide experienced and beginner divers alike with a countless wonders to explore. 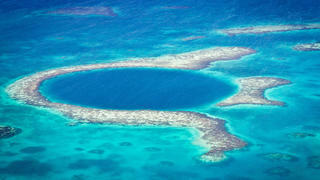 The Great Blue Hole is one of the best dive sites in the world, not only the Western Caribbean. Located just 70km from Belize City, near a small atoll called Lighthouse Reef, this vast sinkhole measures 300 metres across and descends into a blue abyss nearly 125 metres deep. This dive is not for the faint-hearted as it is one of the best places to swim with sharks. Diver’s regularly record hammerheads, blacktips, Caribbean reef and nurse sharks around the waters of the Great Blue Hole. Thankfully these species are not renowned for aggression and ignore divers, although experience and caution cannot be overstated. Huge groupers are a typical, and slightly unnerving, fish species to find, as well as the prettier likes of parrotfish, butterfly fish and angelfish. This is one for any serious diver’s bucket list. Don’t just take our word for it… the legendary Jacques Cousteau also considered it one of the best scuba diving sites on the planet. The largest of Honduras’ Bay Islands, Roatán is a hotspot for clued up divers. There are some memorable dive sites here, many within comfortable distances from shore. Request your superyacht captain to sail between the islands of Útila and Guanaja, and find Mary’s Place on Roatán. The site is on the south side of the island between the towns of Coxen Hole and French Harbour. The dive is truly world-class and a highlight is the two vertical swim-throughs. An intermediate standard with good buoyancy control is required to get through these crevices but the concentration and dexterity pays dividends. Expect to see coral banded shrimp, hawksbill turtles, a multitude of fish species, coral bearing flamingo tongues and even seahorses with a bit of luck. Another highlight is swimming over the wall to witness a dizzying drop off. Mary’s Place in Honduras is an absolute must if you want to experience the best diving the Western Caribbean has to offer. The largest of Honduras’ Bay Islands, Roatán is a hotspot for clued up divers. There are some memorable dive sites here, many within comfortable distances from shore. Request your superyacht captain to sail between the islands of Útila and Guanaja, and find Mary’s Place on Roatán. The site is on the south side of the island between the towns of Coxen Hole and French Harbour. The dive is truly world-class and a highlight is the two vertical swim-throughs. An intermediate standard with good buoyancy control is required to get through these crevices but the concentration and dexterity pays dividends. Expect to see coral banded shrimp, hawksbill turtles, a multitude of fish species, coral bearing flamingo tongues and even seahorses with a bit of luck. Another highlight is swimming over the wall to witness a dizzying drop off. Mary’s Place in Honduras is an absolute must if you want to experience the best diving the Western Caribbean has to offer. Another site that should be seen in Roatán is the Prince Albert. 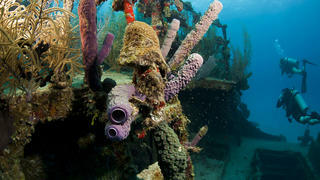 This vessel was sunk nearly 30 years ago and over the decades the 165-foot freighter has blossomed with a kaleidoscope of coral species, making it one of the best shipwreck dives in the Western Caribbean. Qualified PADI Wreck Divers can enter and explore the interior, whilst the exterior is equally fascinating. Squid, southern stingrays and eagle rays are common sights; you should also expect to see schools of creole wrasse and possibly turtles. Arrow crabs, seahorses and a colony of garden eels also call the wreck home, and the shimmering display of schools of silversides can be seen inside the structure. A DC-3 plane fuselage lies next to the wreck and is also well worth investigating. The Great Blue Hole may be the big lure to Belize but divers should also not miss the Half Moon Caye. Located at the southeast corner of the same Lighthouse Reef atoll, this awe-inspiring site is in direct contrast to the profound stillness and impossible blue of the hole. 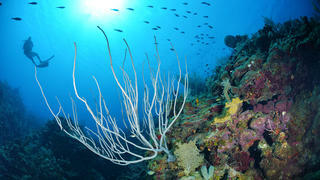 Here there is activity and a teeming array of colour and spectacle found along 1828 metres of vertical reef wall. The dive begins shallow and then drops off creating a free fall effect over spur-and-groove canyons thick with different coral species. There are some jaw-dropping sponge formations and large pelagics such as groupers, sea turtles and eagle rays are almost certain to be seen. Cozumel is Mexico’s largest island and is located in the Western Caribbean, 19km off the coastline of the Yucatan Peninsula, 72km south of Cancun. Cozumel boasts a wide range of dive sites but the pick of them all is Colombia Wall. This site is commonly separated into two dives; Colombia Deep and Colombia Shallows. The shallows are a firm favourite as it’s an inexpensive and technically simple dive that rewards with a wonderful mix of rays, turtles, colourful corals and countless fish species. Colombia Deep has 15 metre coral pillars rising up from the seabed at 30 metres deep, where the reef gently slopes away into the endless blue depths. Nurse sharks, rays and turtles are pretty much guaranteed at this famous diving site in the Western Caribbean, where you can enjoy wall diving with plenty of swim-throughs.